St Mary Magdalene & St Lawrence is in Priory Road. It occupies a prominent position on the Davington ridge to the west of Faversham town centre and can be seen from many neighbouring places. The church serves the Church of England parish of The Brents and Davington, which includes about a third of the town's population. 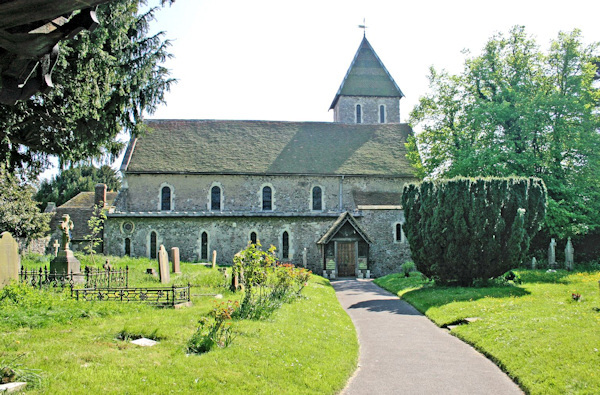 The lively parish frequently arranges social and community events and details of these are publicised locally. Visitors are welcome. Details of access to the church are also posted on its noticeboard. Play and fun facilities for children are provided in the church. The historic and beautiful building, dating from 1153, is Grade I listed and the oldest extant building in the Faversham area. The church is widely regarded as a simple yet exquisite jewel and was originally part of a Benedictine priory founded for a community of 26 nuns. The priory expired just prior to the Reformation and much of its complex of buildings demolished. However, the church remained and continued to serve the local parish, with unbroken divine worship down the centuries. Much of the surviving fabric is medieval with many interesting features, however, all of its magnificent stained glass is by the 19th century artistic pioneer Thomas Willement, who is buried in a family vault within the church.